Pala International’s Jason Stephenson went up to the nearby Pala Mining District on Oct 13 to visit some of the local mines and talk with a few miners who are still actively hunting for gems and minerals. Jason was invited by Roland Reed, who owns and operates the Elizabeth R mine. Roland’s mining operations began in 1973 and he has definitely put in a lot of underground square footage. It was reported by Sinkankas (1997) that Roland had single-handedly driven more than 300 meters of tunnel, which led to a few significant finds of morganite-bearing pockets. The productive years were 1974–1975 and 1982, producing about 100 kg. 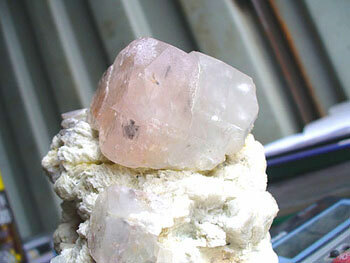 of morganite specimens with crystals up to 13 cm. across. Roland struck another rich pocket zone in 1992 that produced the finest morganite specimens in Southern California, according to Sinkankas (1997). This treasure had a large cleavelandite base, about 50 cm. 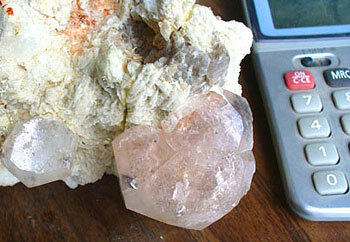 across, with seven large morganite crystals up to 15 cm. mixed with some smaller ones. 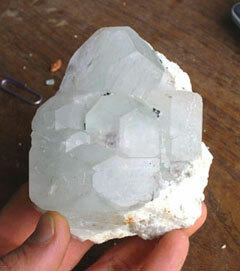 The morganites were euhedral and glassy with some pale aquamarine cores, similar in color scheme to the aquamarine cluster pictured below (Fisher 2002). Then, in 2000, the Oceanview mine, which was originally above the Elizabeth R, was sold to Jeff Swanger. Jeff took over mining operations below the Elizabeth R and carried the original name with him. The new Oceanview tunnel started and Jeff and crew began their search for the pegmatite. Jeff’s mining operations crew consists of Phil Osborn, Steve Carter, Mark Baker, and Peter Renwick. 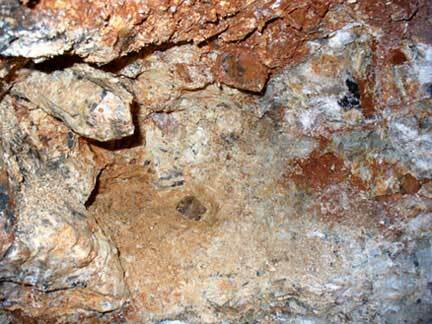 Jeff knew that there had been significant finds of morganite-bearing pockets in the same pegmatite just above in the Elizabeth R mine, so the chances of hitting mineral-rich pockets were promising. A 400-foot main tunnel had been established with several branches leading up to intersect the pegmatite. 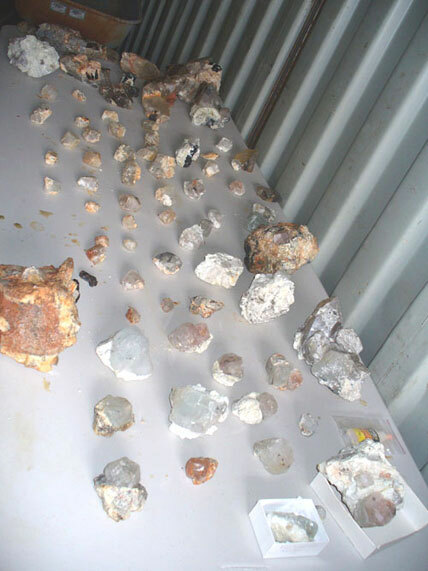 After several years of tunneling to reach the rich zone of the pegmatite, the workings have yielded a few mineral-rich zones with a variety of minerals from feldspars, quartzes, tourmalines, spudomenes, and beryls, along with some rare ones. With a bubble on top. View of the glassy termination where the bubble can be seen. (Photo: Jason Stephenson). The most recent and notable find was made on September 22, 2007. This underground surprise coincided with Jeff’s birthday and has been named the 49er pocket for one—maybe two—obvious reasons. This most recent discovery has yielded a beautiful selection of beryls, gemmy quartz, intricate aquamarine clusters on matrix, tabular morganinte crystals, and a complex dodecahedral-like beryl crystal with pink in the middle and a blue rind. 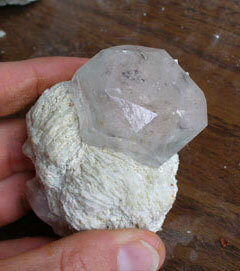 The ultimate specimen was a bicolor (half morganite, half aquamarine) hexagonal crystal with a bubble showing through a glassy termination on top of a clevelandite/quartz matrix. 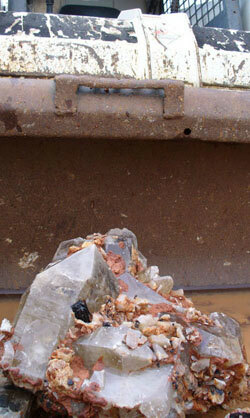 Some large quartz clusters were also removed from the pocket intact, weighing several hundred pounds, as shown in the photo at the top of this article. 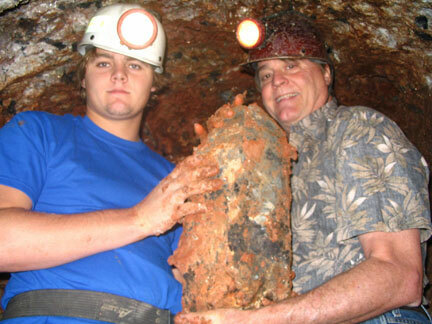 Bill Larson and son Carl went up to the Oceanview on November 23 to see for themselves this exciting new discovery. Amazingly Jeff and crew were still digging out the same mineral-rich pocket zone. This long pocket had continued to produce a variety of berlys, smoky quartz on feldspar, large citrine clusters, and dark purple tourmaline crystals.